Abu Dhabi, United Arab Emirates- 23 February, 2019: Opening its doors later this year, Abu Dhabi University’s (ADU) new Al Ain campus is architecturally inspired by the Ghaf Tree, the logo of the Year of Tolerance. The Ghaf tree is a symbol of tolerance, strength, prosperity and stability. The four elements of the tree were taken into account during all phases of the design and implementation of the new campus, down to its finest detail. The concept of tolerance is reflected in the spaces allocated to social activities, their wide capacity, and the quality of the new facilities available for students and employees. Strength is demonstrated by the use of bold forms and shapes that flow through the interiors and exteriors of the building, complemented by flexible shapes which will allow students to fully utilize the resourceful spaces. The accent colors that light up the campus symbolize how creativity can flourish with the power of education. The comfort and leisure of the facilities offer a peaceful place for students, faculty and staff alike to network and encourages the principles of tolerance amongst the various nationalities represented by members of the ADU community. The new Al Ain campus, which ADU recently announced would be welcoming its first students in the next academic year, cost approximately AED300 million, with facilities occupying more than 28,000 square meters during the first phase. The new campus includes more than 70 lecture halls and laboratories, with 137 offices for staff and faculty, and state-of-the-art scientific equipment that meets international quality standards. The campus will accommodate 2,500 students during its first phase with a total capacity of 5,000 students. It will provide a holistic learning environment, whilst maintaining separate learning spaces for male and female students. 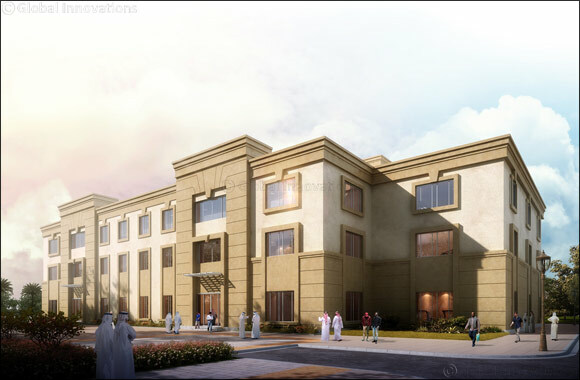 The new building, located in Al Ain’s Asharej district, will include 36 scientific laboratories, a moot courtroom, 36 classrooms and a wide variety of facilities such as a gymnasium, aerobics studio, games room and cafeteria. The final additions will consist of a library with a unique reading area, book area, discussion rooms and an office for the Student Council.